No graduation took place at Camp San Onofre. 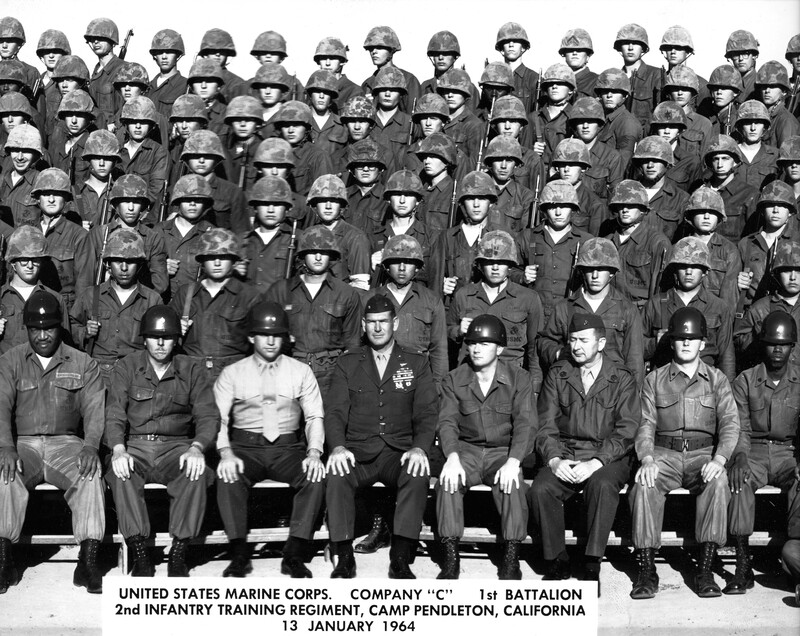 Our only document was a photograph of Charlie Company – including a few NCOs, such as the First Sergeant, whom we rarely saw, and our glowering troop leaders, whom we saw too much. The training schedule covered weapons and tactics of the combat infantryman. 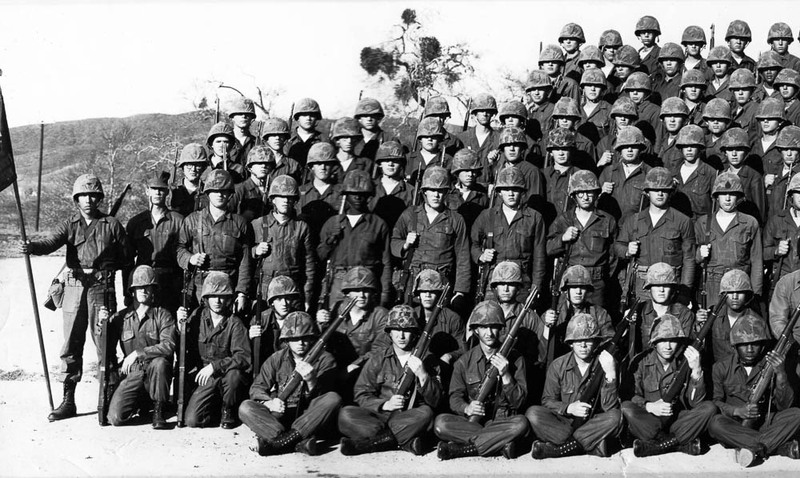 Just as the Marine Corps considered every man a rifleman, infantry training familiarized us with weapons and tactics. In an emergency, a unit could turn clerks and cooks into riflemen. The 1st Marine Division had transformed the rear echelon into reinforcements during the campaign at the Chosin Reservoir in North Korea in 1950. Well worth reading is L. Montross & N. Canzona, The Chosin Reservoir Campaign (U.S. Gov’t Printing Office 1957)(Vol. III of U.S. Marine Operations in Korea, 1950-53). It’s still for sale on the website of the National Museum of the Marine Corps. Rifle grenades are regarded as the rifleman’s most reliable weapon against tanks, pill boxes, and exposed enemy personnel. At first, they may seem to be to small to do much damage, but their power is far greater than their appearance would lead one to believe. 4th PLATOON. THE FUTURE BLOGGER STANDS AT THE END OF THE FOURTH RANK. An elegant old sergeant with faded utilities taught 4th platoon squad tactics. He demonstrated movements directed by hand signals, such as the wedge, in which the platoon coalesces into a point. This maneuver, he told us, also was used to cow unruly crowds. Other hand signals included forward, halt, dismount, down and take cover, double time, change direction, leaders join me, enemy in sight, fix bayonets, and commence firing. We learned to fire the bazooka, an anti-tank weapon. The official name was the 3.5-inch rocket launcher. Two men operated the device, a gunner and a loader. The launcher is a smooth-bore open tube, 60.25 inches long. When the rocket is loaded in the breech [rear] end, an electrical circuit is completed. A magneto-type firing device in the trigger grip then provides the current for igniting the rocket. Guidebook for Marines, p. 283. The gunner held and aimed the weapon, which rested on the shoulder. The loader inserted the rocket in the rear of the weapon. When armed, the loader patted the operator on the helmet once to commence firing. Then he pulled the trigger. We learned to fire mortars. There were two kinds, the 60-mm. and the 81-mm. An infantry company carried three 60-mm. mortars in its weapons platoon. The gunner alone could carry the 60-mm. The 60mm mortar is the company commander’s own light, portable artillery; and is known as his ‘weapon of opportunity.’. . . This is due to the fact that the 60mm mortar is always under his control and therefore always readily available for use against targets that are vulnerable to small, high explosive firing weapons. The mortar is a heavy weapon that requires only one man. The 81-mm. a heavier weapon, requires two, the second of whom carries the baseplate. The battalion commander controlled these mortars in the battalion’s weapons company. The 60-mm. fell under the command of a rifle company. The legendary E. B. Sledge, after he flunked himself out of an officer-candidate course, went into combat in the Pacific at Peleliu carrying a 60-mm. mortar. E. B. Sledge, With the Old Breed at Peleliu and Okinawa, p. 17 (Naval Institute Press 1981). We essayed combat in built-up areas by training in a mock town. I remember the town but not the training, except that two men knock open the door from either side and then move in as fast as possible. We supplemented this another day by walking through a field of pop-up targets buried in the underbrush. We fired our M-1s at them. Surely we used blanks. We watched a demonstration of the light machine gun (.30-caliber) and heavy machine gun (.50-caliber). I cannot recall firing these weapons. But one evening we did fire thousands of rounds of tracer shells from the Browning Automatic Rifle. This was the legendary weapon called the B-A-R. At 20 pounds with full magazine, the BAR was almost twice as heavy as the M1 and M14 service rifles. It served as the automatic weapon in the rifle squad of 15 men. Each fire team is built around a BAR. [A fire team consisted of three riflemen and one automatic rifleman, with three fire teams to a rifle squad.] This gives each rifle squad three of these weapons and each rifle platoon nine. Because of its great fire power it is the most vital weapon of the platoon. Guidebook for Marines, p. 231. The maximum range of the BAR was only 500 yards, but its normal rate of fire was 550 rounds per minute. The BAR man typically fired in short bursts. 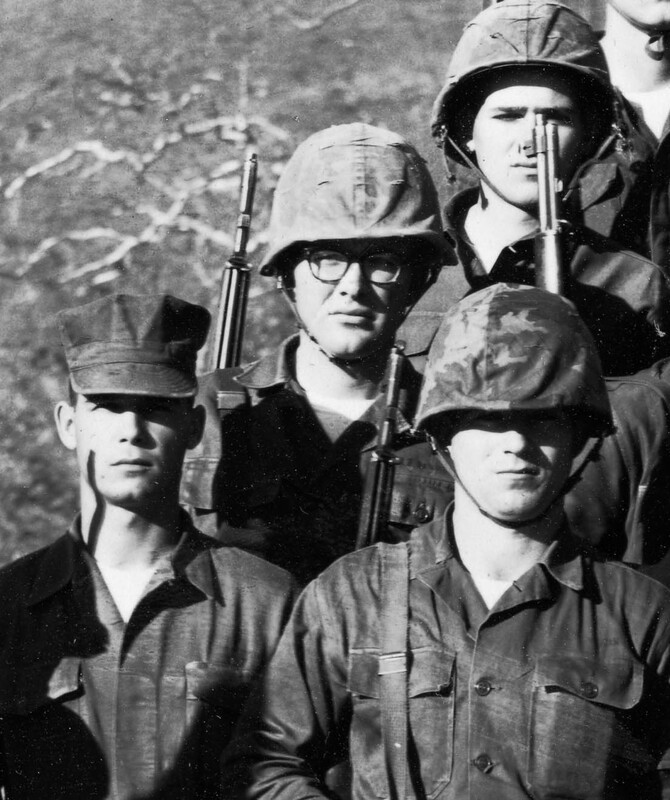 The M14 having been designed to switch from semi-automatic operation to full automatic, by 1964 the Marine Corps was retiring the BAR. Each of us got to take these beautiful beasts for a last ride in a shallow valley. We set them up on bipod legs and fired tracer shells (which light up) at night. Then they were probably junked. By February, men left the company in clumps to attend advanced schools. When only a couple of dozen of us remained, the regiment organized a detail to act as aggressors against a detachment of Seabees who were visiting Camp Pendleton for some combat training. Seabees are the acronym for Naval Construction Battalions (CBs), which did not enter combat but did find themselves on hostile shores. They dug in one night for a reality drill, and us newly minted Jarheads attempted to infiltrate their defenses in the middle of the night. The prizes for us – strictly unofficial – consisted of the fur-lined Navy jackets the Seabees wore and the small selector switches that turned M14s into automatic weapons. The Marine Corps did not issue those switches to privates like us. The night was cold. By midnight, the Seabee sentries had fallen fast asleep. We had little trouble wandering among their foxholes on the forward slope of the hill. But we captured no special jackets and no switches. By dawn, we had finished our combat training. In a day or so, I boarded a small bus back to San Diego. Salty now – or so we thought – our little detail passed the Recruit Depot and boarded the ferry in San Diego Harbor for Coronado Island. Now a bridge makes the crossing, but then we drove off the ferry onto an island I had last seen as a Naval dependent in 1945 quartered in Defense Village. Now we reported to Landing Force Training Unit Pacific, a Marine detachment on San Diego Bay at the Naval Amphibious Base, Coronado.